Friends of Thornton Creek Park #1 are happy to announce that we have signed a contract with GAYNOR, Inc. to manage the planning process for the Park in 2011. 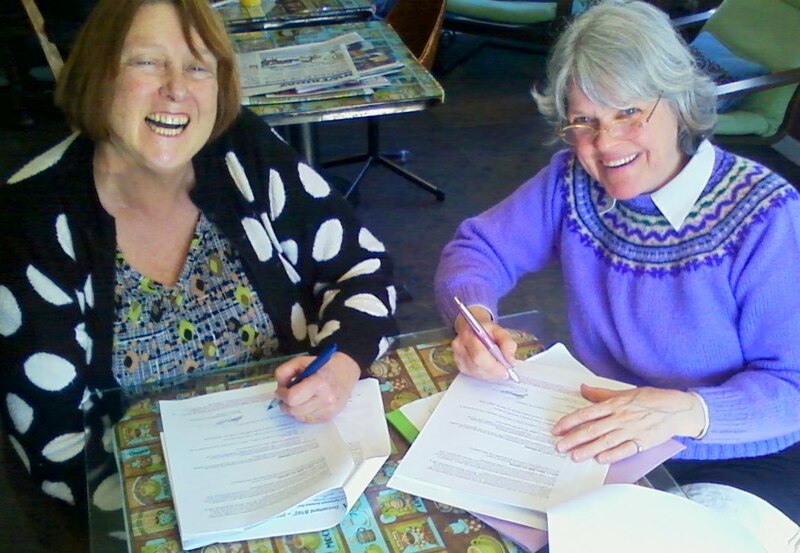 Anita Fisk signed for the Friends, and Peggy Gaynor signed for GAYNOR, Inc. at Treehouse Coffee last Friday (photo). The planning process will include three public meetings to be scheduled for March-June. Watch for announcements of the dates and location, to be in our Pinehurst / JacksonPark / OlympicHills area. For maps showing the area of the Park, and for photos taken in the Park, see other posts and pages of this site. The community is lucky to have somebody so experienced and passionate involved with Thornton Creek Park #1.